The frozen tundras of Fargo and Lambeau Field are Bimini Islands compared to what viewers can expect in Fortitude. Set in the Arctic Circle and co-starring its vast snowscapes, the fledgling Pivot network’s first original drama series has an oft-stunningly original look. Its overall storyline is on more familiar ground, yet still a grabber as this 12-episode murder mystery slowly gears up. Pivot made the first five hours available for review, with back-to-back episodes launching Fortitude on Thursday, Jan. 29th. For most viewers this likely will be a two-fold exploratory expedition -- to a faraway place and to Pivot for the first time. 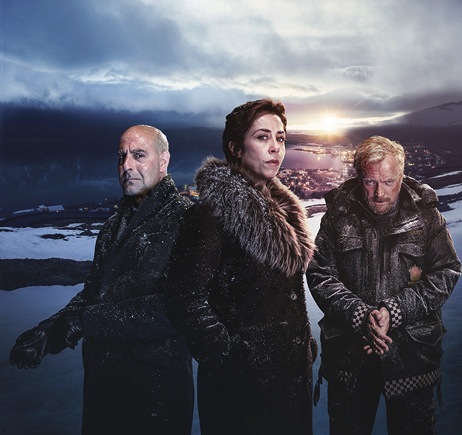 The network debuted on Aug. 1, 2013, but Fortitude is its big coming out party. Every cable network hopes to make its mark with a signature series, as did Comedy Central with South Park, AMC with Mad Men and FX with The Shield. First you have to get noticed. Then you need to keep delivering. Fortitude doubles as the name of a small frozen community whose governor, Hildur Odegard (Sofie Grabol), has big plans for a Glacier Hotel Project that she envisions as a tourist magnet and safe haven from the area’s at times lethal wildlife. The designs are in place, but Hildur needs official approval from an Arctic Research Centre headed by Professor Charlie Stoddart (Christopher Eccleston). A possibly stunning archaeological discovery puts him of a mind to block the project before Stoddardt is found very badly mutilated and presumably dead. Heading the investigation is town sheriff Dan Anderssen (Richard Dormer), a very taciturn man with bottled up emotions and thin, guttural smiles. Near the close of Thursday’s second hour, he receives unwanted help from detective chief inspector Eugene Morton (Stanley Tucci), a London-based former FBI agent who flies in to take charge. Tucci plays this role in very low-key fashion -- to the point where perhaps his pulse should be taken. But as Fortitude unfolds he begins to register more vividly as a firm, dry-humored gumshoe who knows what he wants and how to get it. Suspects and red herrings pile up in these first five hours, with just about everyone except Morton a possible murderer or accomplice. There’s also a guilt-ridden, cancer-inflicted nature photographer named Henry Tyson (the always good Michael Gambon), who takes to even heavier drinking after his eyewitness participation in a chilling opening scene involving a bear and its very unlucky human prey. Fortitude then jumps ahead three months. The series strongly suggest some sort of immortality in play. Does anyone ever really die in Fortitude? There’s also the specter of a possibly surviving wooly mammoth from some 32,000 years ago. A badly bloodied shirt also comes into play, prompting Sheriff Anderssen to react very viscerally at the end of Hour 4. Fortitude can be slow-going at times. And it’s still an open question whether its central murder mystery can sustain a number of false leads and other mis-directions for a full 12 hours. But the resplendent panoramic visuals are a show in themselves. So the bigger your HD screen the better, with Fortitude’s overriding whodunit gradually firming its grip while those icy, snowy vistas stay strong.